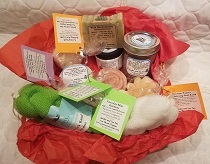 Moisturize, hydrate, relax, cleanse, detoxify, pamper yourself with these wonderful handcrafted gift baskets, gift bags and gift sets made right here at the Inn. Gift Basket - Spoil someone or just yourself with one of these heavenly gift baskets. 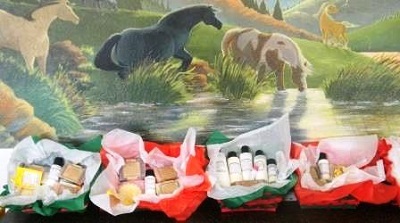 Includes at least one or more handcrafted soaps, bath bombs, bath salts, a lotion or cream. Handcrafted items/scents may vary from picture. Soap Assortment - A lovely floral assortment of four of our most popular soaps. Includes Fresh Cut Roses, Lavender, Pomegranate Orange and Spring Floral.